This WordPress theme for writers gives you great opportunity to engage visitors in your content with its sleek and clutter-free design. This theme is loaded with all the necessary features that yield a high quality website which requires minimum efforts for its handling. It is cleverly designed to make content hero and rest of the things will take back seat. Its typography is thoughtfully decided with proper line spacing, correct line lengths and other measures taken to ensure convenient reading and appealing content. Create stunning inner pages according to your needs in seconds without writing a single line of code through its themes option panel. Additionally, almost all components of this WordPress theme for writers are customizable to give website the hint of your personality and make it represent your thoughts. It is integrated with WooCommerce, WPML and Contact Form 7 plugin along with great compatibility with third party plugins to include specific functionality. 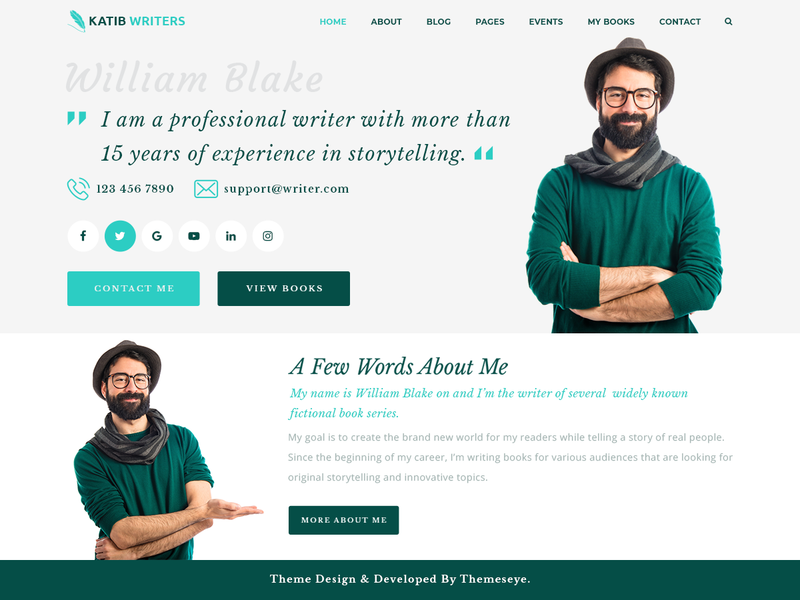 With the increasing use of mobiles and tablets, this WordPress theme for writers is essentially a responsive one that adjusts its layout on varying screen sizes. It loads on all browsing platforms and supports multilingualism with WPML plugin compatibility and RTL writing style support. It has a range of excellent shortcodes that minimizes your work and awesome Font Awesome icons pack to enhance the look of the website and make it more attractive. This WP writer theme comes with friendly support from our expert developers and regular theme updates for one year. It has super-efficient SEO and fast loading pages for better site experience.